JAPON – – Sunabara - It was recently announced that the 36 stone tools found in 2009 at the Sunabara site (砂原遺跡) in Izumo city, Shimane prefecture have been dated to 110,000-120,000 years old, making them Japan’s oldest. Since their discovery almost five years ago, there had been some debate over their age (at one point, their age was broadened to between 70,000 and 120,000 years old). This latest announcement, however, generally agrees with that originally presented at the time of discovery. Researchers were able to determine their age after recognizing Sambe Kisuki tephra (三瓶木次火山灰: 110-115ka) in the same soil layer that the tools had been found in. 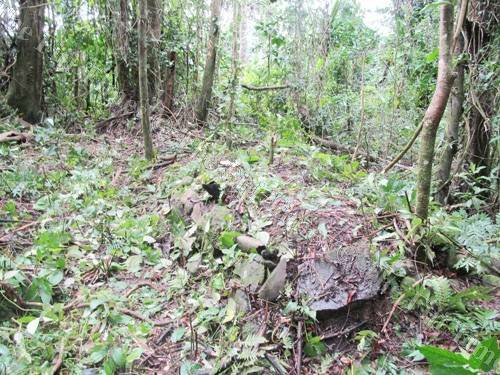 FIDJI – Lautoka - The historical discovery of two village sites dating back to at least 500 years has been made by a team from the Fiji Museum. Following a request from villagers on an island off Lautoka, the team carried out a survey in the Koroyanitu mountain range in Lautoka last week. The survey resulted in the discovery of two old village sites. The villages would have existed between the years 1500 and 1800. "Most villages were established on high ground like a fort at that time because of tribal wars to enable people to lookout for their enemies. "It's a source of ancestral link for the villagers and it also shows just how the early Fijians were moving about and they ended up on the island. "Their movements have been confirmed by the Native Lands Commission records and the nearby villagers of Abaca and Navilawa in the Koroyanitu mountain range." Mr Nakoro said the villagers could have ended up on the outer island either to escape their enemies or in search of marine resources. "The Koroyanitu mountain range is the origin of most villages in the West, especially in Nadi and Lautoka." 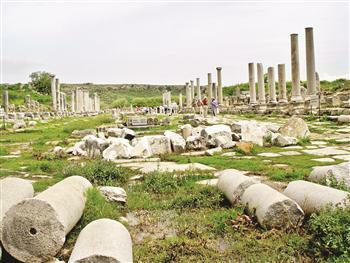 TURQUIE – Perge - The ancient city of Perge in the southern province of Antalya will finally open to visitors by the end of summer following excavations that have revealed a façade. The Perge excavations are the longest-running in Turkey. Over 65 years, archaeologists have unearthed 20 to 25 percent of the ancient city. The unearthed remains were the most important parts of the city. Among those ruins are two Turkish baths, city gates, an agora, streets, three fountains and some parts of houses. Archaeologists found mosaics and the street of the ancient city during the latest excavations. For the protection of the artifacts, necessary measures are also being taken in the city. The artifacts will remain covered with sand until the opening of the ancient city. Water channels that have been unearthed during the excavations have been restored with the original aesthetic architecture of the city, said experts. The experts also worked on taking photographs and drawings and also documenting the latest excavations. The façade of the city have revealed two main sculptures from the nympahion part of the ancient city, as well as eight god and goddess sculptures, while the western column of the city’s three friezes were revealed during the latest excavations. The friezes prove that they belong to Roman era in the 2nd century. They have been protected very well, according to the experts. Earlier, the excavation team discovered a script, a fountain, a god figure, a sculpture and an Eros sculpture. This year and last year, they unearthed more than 200 sculptures in Perge. The sculptures exhibited at the Antalya Museum are all from Perge. The team believes that Perge was one of the largest sculpture ateliers in ancient times. Perge hosted the final process works for sculptures during ancient times. Ancient Perge, one of the chief cities of Pamphylia, was situated between the Rivers Catarrhactes and Cestrus. Perge’s ruins include a theater, a temple of Artemis and two churches. The temple of Artemis was located outside the town. POLOGNE – Sobibor - Polish and Israeli archaeologists discovered traces of an underground tunnel that apparently was never used at the site of the former death camp in Sobibor. The tunnel ran from a barracks to outside the camp fence and may have been dug by the prisoners of the Sonderkommando who worked in the camp burning the corpses of murdered Jews. 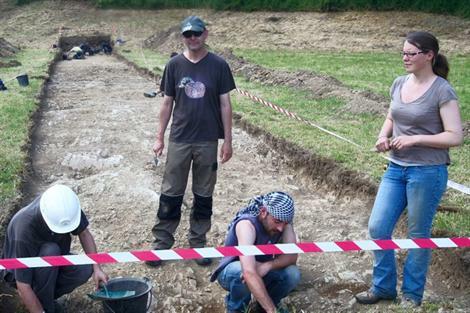 he archaeology work at Sobibor is directed by Wojciech Mazurek of Chelm, Poland, and Yoram Haimi of Israel. Though the tunnel would have helped the prisoners to escape, Mazurek does not believe it was used. “The Germans found the tunnel and therefore shot and then burned the entire crew of the Sonderkommando,” Mazurek told the Gazeta Wyborcza newspaper. At the gas chambers in Sobibor, Nazis murdered about 250,000 Jews mostly from Poland, the Netherlands and Slovakia. 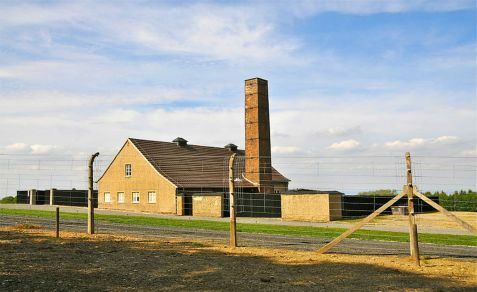 The camp was closed following an uprising on Oct. 14, 1943; about half the remaining prisoners escaped during the uprising. Afterwards, the Germans bulldozed the death camp and tried to disguise it by planting pine trees at the site, which now is home to the Sobibor Museum displaying a pyramid of ashes and crushed bones of the victims, collected from the cremation pits thereafter. FRANCE - Buzet sur Baïse - L’ INRAP termine les fouilles de l’ancien cimetière de la paroisse Saint-Martin. Il a été décelé la présence d’un bâtiment gallo-romain dont il ne reste que la trace d’arase de murs, ainsi que de nombreuses sépultures datées entre le XIe et XIVe siècle. Les lieux ont servi de silos avant d’être transformés en cimetière et de nouveau en silos. L’étude des grains trouvés permettra de connaître la nature et la datation de la nourriture. La paroisse Saint-Martin dépendait du prieuré bénédictin de Buzet, nommé par l’abbaye de Saint-Sever. Les paroisses de Sainte-Foy, de la Chapellenie, Saint-Pierre, Saint-Jean ainsi que Sainte-Quintille et Sainte-Cécile faisait également partie du territoire de Buzet.